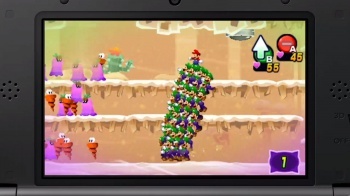 Mario & Luigi: Dream Team is still a ways off, but at least now we have a solid release date for the 3DS title. Mario & Luigi: Dream Team is the latest entry in that odd side series of Mario Bros. titles that are almost roleplaying games, and almost action-platformers, but are also definitely descended from Super Mario Bros. This trend began with Super Mario RPG on the SNES and the titles that followed have been uniformly great, even if they've never found the same success as the core Super Mario entries. Long story short, you should be excited for the 3DS' upcoming Mario & Luigi: Dream Team, which is actually kind of a cruel suggestion on my part as this morning's Nintendo Direct conference revealed that the game won't arrive until August 11. Sure, it's great that we've now got a solid date to mark on our calendars, but that's only slightly less than six months away. Nintendo, don't you realize what the internet has done to our collective attention span? We're no better than gnats at this point, and teasing us with more inventive Super Mario Bros. spinoffs six months in advance is only going to cause your audience to gnash their teeth and wail in anguish as the days slowly tick by. Some may even have forgotten about Mario & Luigi: Dream Team by the time August 11 arrives, so in a way you're shooting yourself in the brightly-colored, family-friendly foot here.